As President Donald Trump continues to turn America into a "shithole nation" he once excoriated, a migrant caravan moves north through Central America ... headed for the United States. Trump suggests the Democrats may have facilitated the caravan's efforts, but there is no doubt that that march benefits Republicans who may think building a wall along America's border with Mexico (the caravan's likely exit) is what the United States should have done long since ... à la Trump's encouragement. 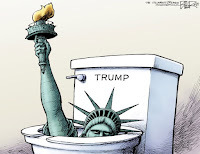 Racism is never far from the mid-term elections due next month and cranking up Trump's sub rosa racism helps to keep uncertain immigrants who may have the right to vote away from the polls where they might be labeled and perhaps, under a Trump regime, sent back to lands they fled. Trump sends the message: "Blacks and browns, stay home. Don't even think of voting Democrat or for anything remotely smelling of labor improvements." The Democrats are keen to win back a majority in the House of Representatives. They may ballyhoo a "blue wave," ("blue" indicates Democrats or so-called liberals, while "red" denotes Republicans and so-called conservatives) but never put it beyond Democrats' reach to screw up their own advantages. And re-balancing the Senate is even a more implausible likelihood. The Trump Tyranny has to be ranked, on my odds chart, as an unqualified success. As was once the rallying cry, "Hoch der Kaiser!" Judy Woodruff (pbs News Hour) I should say that ...The Toronto Star ... keeps track, has been for many months keeping track of the president's statements. There are other news organizations doing that. There is something almost quaint after almost two years about the thought that a lying president might be worthy of news coverage. At least in the United Nations there was a grown up in the room who laughed when the president of the United States made his assertions. And here I sit -- dumbass liberal that I am -- still wondering and whining about how it can be that Trump supporters are routinely unwilling to consider the propositions Trump hosts and they stand behind. And the money-starved media fall dutifully into lock-step, covering and thus further elevating this Big Daddy.